From the ideas implemented in the first versions of TouchFLO and TouchFLO 3D HTC gradually came to understand the importance of phone interfaces and the user experience, which can remain the same when the customers change different phone models. At the moment only a handful of manufacturers put this idea into action. HTC and Samsung are the best examples of the trend. Both companies make efforts and understand the importance of the proprietary and uniform interface for its products. Samsung offers TouchWIZ for mobile phones and smartphones on Android and WM. 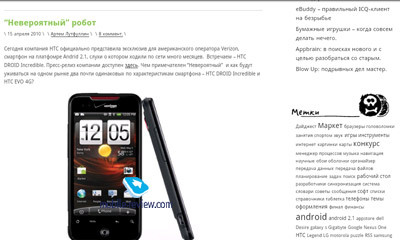 HTC has Sense, which considerably influences our ideas about Android. 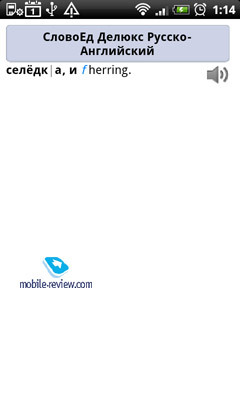 I would like to mention from the outset that this review describes all features of Android 2.1 with HTC Sense interface and not just some separate ones. You will find common points with the review of Android 2.1, references to the previous version of Sense, comparison of the functionality of Sense and Android 2.1. The purpose of the review is not just to pinpoint all HTC additions to the new shell, but to give a detailed description of all features and capabilities of the combination between Android 2.1 and HTC Sense, which you can find in HTC Desire and Legend. In future the link to this article will be added to all new reviews of HTC Android smartphones with the same functionality according to the tests. If you have any comments or would like to add or recommend anything feel free to write on forum or send me an e-mail. The article can be easily updated to take into account such comments and recommendations. When you switch an HTC Android device with Sense interface for the first time you see the welcome screen offering tips on how to use the smartphone and customize some of the settings. 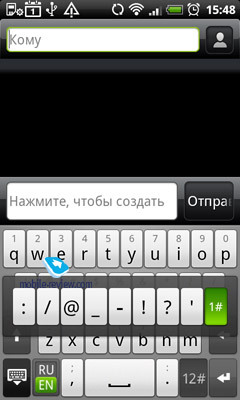 First you can choose a language, and then you are given a tutorial on how to input the text with the keypad. This detailed interactive course explains how to enter letters and additional symbols by pressing and holding keys, showcases the auto completion and other features. Then you choose the type of connection to the Internet - 2G/3G/Wi-Fi or just Wi-Fi. The next screen allows customizing Wi-Fi connection. After this we have screens with Google positioning services, accounts in Google and beyond. 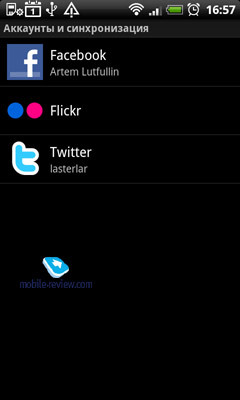 The next screen helps to manage accounts in social networks: Twitter, Facebook and Flickr. Then you can select time, date and time zone. The last settings screen offers to enable the automatic backup of some data on the memory card to ensure that the settings reset does not destroy the bookmarks, messages and other parameters. To unblock Sense you have to drag down the arc on the lock screen or push the Menu key. On the arc users have access to useful information: current time and date (day of the week, date, month and year) followed by the carrier (network) name. Under the arc you see the information on missed calls or unread messages. One of the disadvantages is the fact that despite acres of space under the arc all missed events are displayed there. You see either the last missed call or the message, but they are not displayed together. The lock screen can also show calendar events, but it happens only at the time of notification, which is not very convenient. If you have an event scheduled for 18.00 with the notification of 5 minutes prior to it, at17:55 the handset will signal the event and show the relevant information over the locked screen. If you press "Postpone" then during the next activation you will not have any information about the event whether above or under the lock arc. 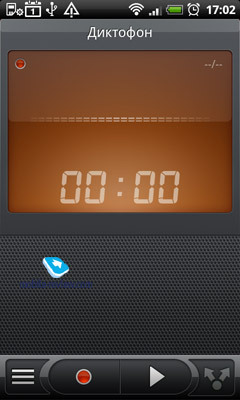 Over the lock screen are displayed some other events as well, for example timer end time, if set. Contrasting to the standard Android 2.1 in Sense lock window you cannot activate the silent mode with one move of a slider key, which is hardly an improvement. In the settings there is no separate option to set the time of smartphone lockup. 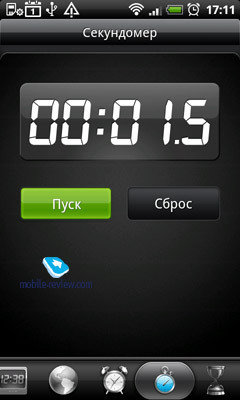 Instead you can adjust the time to shutdown the screen (15, 30 seconds, 1, 2, 10, 30 minutes). If you activate the screen after it, you will see the lock screen. The workspace of HTC Sense is represented by seven horizontal screens. 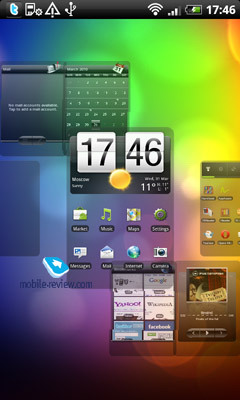 Each screen is a separate home screen area where you can place different elements (widgets, shortcuts for software or contacts and other information) and these screens are connected by the common home screen picture and the function of screens switch. You can switch between the screens differently. First option. Move your finger over the screen from left to write or vice versa. By browsing through one screen you move to the adjacent screen. It can also be done with the help of the hardware button, trackball or touchpad under the screen. In the last variant you have to move your finger across it. Press "Home" in any screen and you are returned to the main one. While switching between the screens you can see the panel at the bottom, which indicates your location in one of 7 screens. Second option. If you "pinch" the screen with two fingers you will open the matrix of all screens, click the one you need and you will move there. 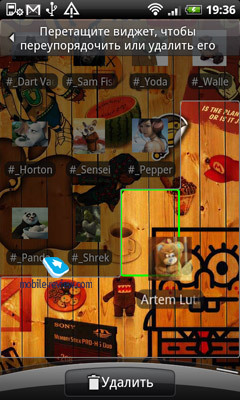 The same matrix can be activated by pressing "Home" in the main screen. 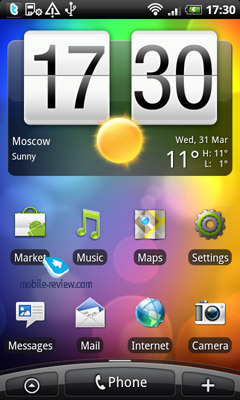 HTC Sense, along with the standard Android supports one picture on the home screen. 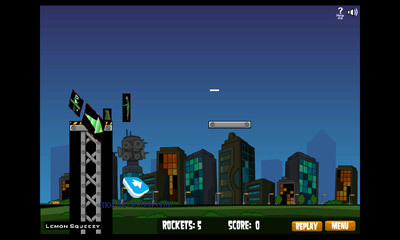 The central part of the picture is seen on the main screen, while its edges are visible when you go to left or right screens. 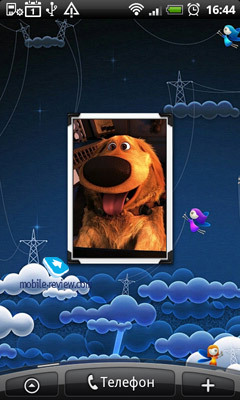 Live images with activities (all Android 2.1 standard pictures and one from HTC are available), or static pictures can be used for wallpapers. 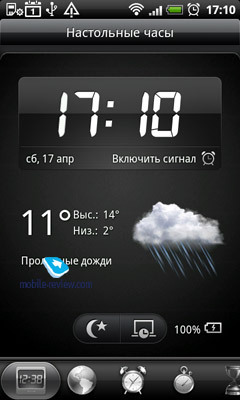 Widgets are graphic modules with particular content: weather, time, photo albums and so on. The majority of users understand the nature of widgets pretty well and they are not surprised by widgets in Android. They have fixed dimensions (so a particular widget cannot be enlarged or downsized). There are full screen widgets and the ones as tiny as usual icons. Shortcuts are active links to applications, contacts, mailboxes or bookmarks. A shortcut may be assigned not only to an application or Contacts software, but to a particular user or message as well. The icons of selected playlists also belong to this group. 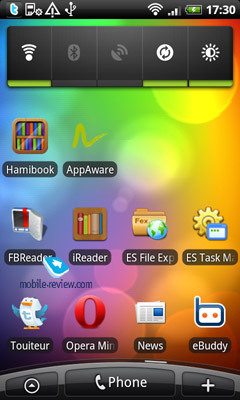 Application shortcuts can be easily dragged onto the screen from the menu or by selecting the option in the applications list. Contacts shortcuts are placed here via Add menu. One screen hosts up to 16 shortcuts with 4 in each line. The size of shortcuts is fixed whether it is an application icon or a link to the call for the selected contact. Folders contain a particular type of content and are opened in a semitransparent popup window when you click a folder. 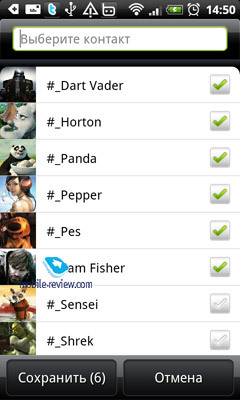 The folder may house contacts, favorite contacts or files sent via Bluetooth. The contacts opened from such folders can only be browsed and opened. There are no search or customization options. The elements placed on the screen can be easily dragged from screen to screen. You just have to press and hold the element, which activates the interface for dragging/deleting. Sense on Android also has these mini programs with particular features everyone knows well from many mobile and desktop systems (Vista, Windows 7) and several other applications like Opera browser. 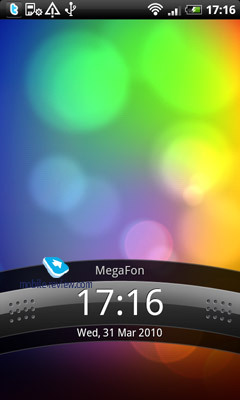 As a standard feature of Android 2.1 you cannot choose the size (type) of a widget. If this widget is for music, you cannot have one more for the same feature. 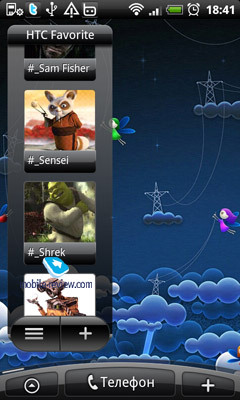 Sense allows several widgets of different size for one feature. It works in the following way: you want to add a weather widget to the central screen, because it is frequently used and you want to access it right after the device starts and not to browse. 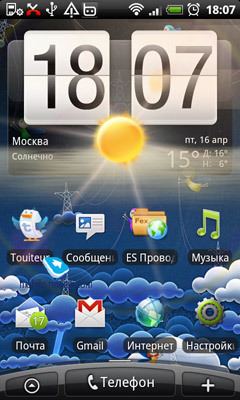 In HTC Sense the users are offered three sizes of widgets: large (full screen), smaller one with more information and the smallest widget featuring only temperature, though it takes little space. The same applies to the widgets of music player, calendar, bookmarks (you can choose the type of content display), shares, hours, etc. The possibility to select the type and size of widgets moves the system into the new league. 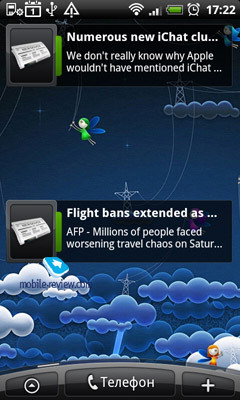 If some users treated widgets as an unnecessary toy before because of excessively bright colors and size, Sense now offers it as a useful information tool, which can successfully substitute several other applications and features. 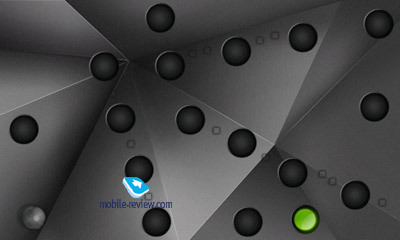 On the screen widgets are aligned with the help of an invisible grid. By the way, a big weather widget in new Sense also adds weather effects to the screen where it is located. If it rains the screen will feature raindrops, while during the snowfall it shows off snowflakes. 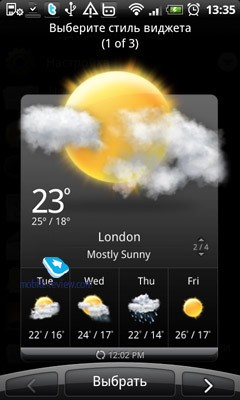 The same effect will be in force if you add a proprietary HTC widget with weather and clock. 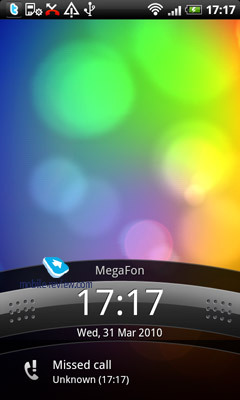 One screen has enough space for 4-5 widgets with weather, music player, time, calendar events and so on. In the new version of Sense apart from weather effects for the full screen weather widget we also have a button for new widgets. 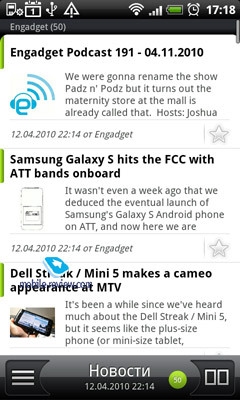 When you press "Add" and choose widgets (in Android 2.1 all widgets are placed in one list, but before they were classified into standard and proprietary) at the top you see a button for additional mini programs. In the current version HTC has added three new widgets: "Notes", "Tips calculator" and "This day in history" – a widget where you can read about the important historic events, which took place on this day before. 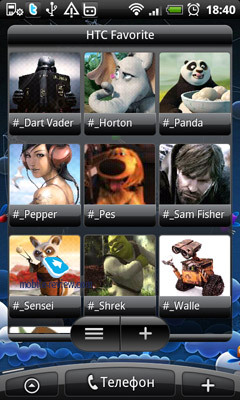 Similar to the first Sense for Android here we have "Themes". Capitalizing on the capability to drag screen elements to other screens and putting them in any order HTC came up with the home screen profiles. 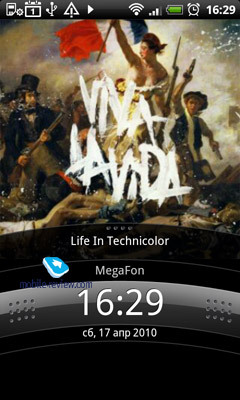 A theme is a picture for the home and lock screens with all widgets you dragged there in the given order. Why do you need themes? To simplify user experience with the phone and customize it for different purposes with one press. For example, from 9.00 to 18.00 you are at work, so the screen shows work related widgets and after 18.00 you can change your theme. The widgets will be predominantly multimedia then. When you go on assignment or travel for vacations the new theme is likely to concentrate on the world clock, Google maps and other useful things. Themes can be used for various occasions and everything is arranged quite logically. When you deal with a dozen of widgets placed in the right order it is natural to save this profile and not to do everything anew next time. 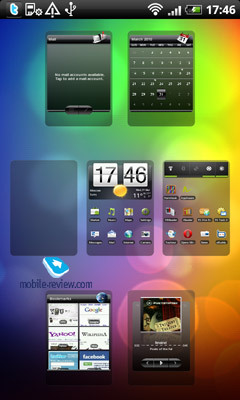 HTC Sense offers six ready profiles (themes): HTC, Society, Work, Entertainment, Travel, Start from scratch. Each profile is highly original. 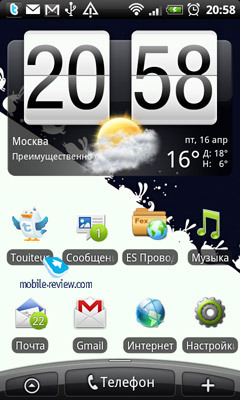 In Work the right screen shows world time and calendar, there are widgets of mail and contacts. Entertainment shows huge clock and widgets of photos and media player, etc. For quick themes change you just have to press "Menu" on home screen and the popup screen will provide you with the option to choose themes. If you want to set the wallpapers for the home and lock screens, drag the necessary widgets to the screen and then save it as the user profile. You can do it with ease and give the profile any name you like. 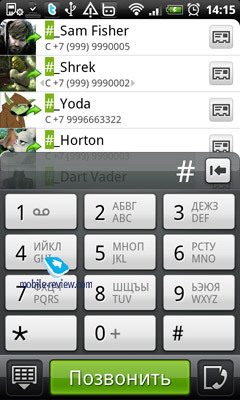 To start calling as quickly as possible press call button under the screen, which will open the screen numerical keypad to enter the number and make a call. Buttons here have not only digits but letters as well (Latin and Cyrillic alphabets), so you call a number or find the necessary contact and call this person. 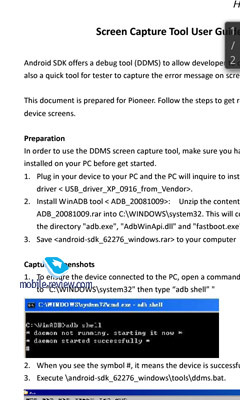 A similar system works in Windows Mobile and is called "Smart Dial". If the smartphone lacks the hardware call button you can start calling by pressing "Phone" at the bottom of the screen. It also leads you to the dialing window similar to Smart Dial. This system allows searching for a contact from the dialing window without entering the phone book. When you enter digits or letters the search starts in contacts and their numbers. For example, if I enter "525" on the numerical keypad, I will get the list of contacts with 5 2 5 in the number (the order is retained), and contacts with letters formed by 525 (JKL+ABC+JKL for the Latin alphabet). 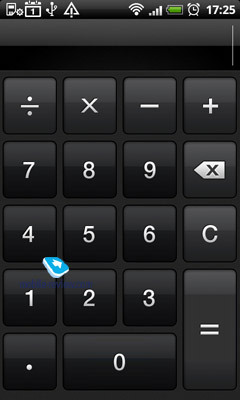 Below numerical keys to the left Sense has an icon to hide the keypad followed by the call button in the center and the icon to go to the recent calls history. Press it and you will move to the fourth part of the phone book with calls history. 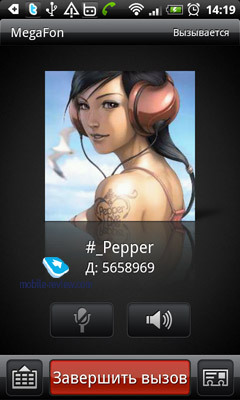 While dialing or receiving the incoming call you see the caller's picture. The image takes up to 30% of the screen, which is enough to recognize the person without moving the smartphone closer to the eyes. If a contact has no assigned pictures you will see a robot during the call. When the screen is blocked and you have an incoming call the dialing window features the caller's name, telephone number and the unlock arc. If you drag it down, you will answer the call, if you drag it up then the call will be ended. 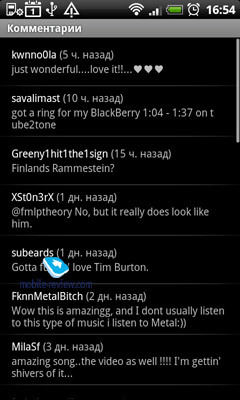 During the conversation the screen shows the contact picture and keys for mute mode and speaker phone mode. If you press Menu at that time an additional window will open. You can arrange conference calls, put the current conversation on hold and do several other things (see the screenshot) there. 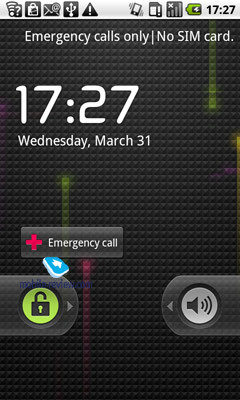 The call status is displayed in the system bar to be dragged from the screen top. If you had a conversation with the caller who is not in the phone book, the system will offer to save a new number in different ways: as a new contact or by adding to the one already in the phone book. When somebody calls you and you cannot answer it is possible to end the call by sending the caller a designated SMS. For example: "Dear Sir, I am extremely busy at the moment. Can you call me later (preferably next year)? Best regards, Ippolit" or anything else. 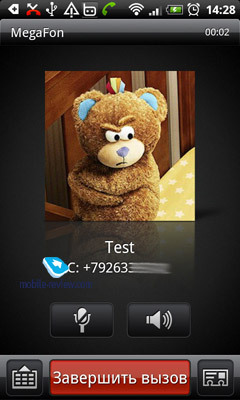 To send the message press Menu during the call no matter whether the screen is blocked or is in a normal mode. 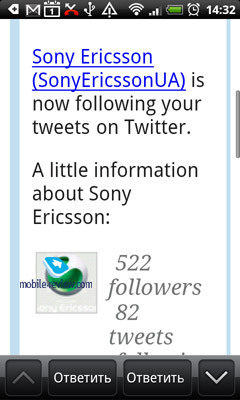 As in new HTC communicators on Windows Mobile this version of Sense for Android devices has "Etiquette" mode. Once activated the call volume goes minimal when you take the phone in hands during the incoming call. In some cases this feature may prove useful. For example, you participate in a meeting, the phone is on the table, and you have forgotten to set it into the silent mode. Then you hear a loud ringtone. Usually you have to take the phone and do something with it smash against the wall (decrease the volume manually, try to end the call or answer it), but when you take new HTC phones with Sense into hands the volume goes minimal automatically. 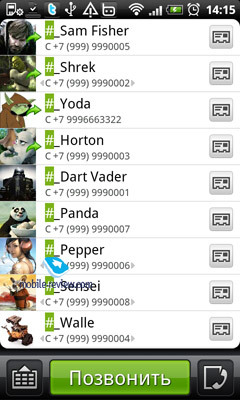 Sense has its own phone book different from Android 2.1. 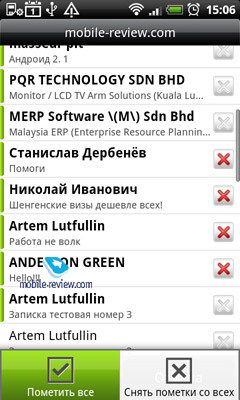 The contacts are displayed in the list; to the right we have a mini picture (contact's photo) and to the left – name and surname. 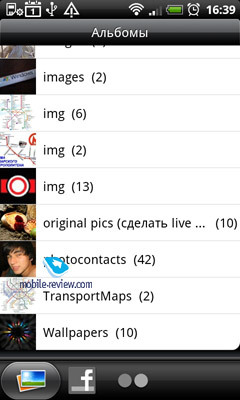 The phonebook shows up to 30 symbols for name and surname (with spaces) with the resolution of 480x800. On the downside we should mention the impossibility to see the caller number right below its name. To achieve this you have to open the contact card and you can't customize the order in which name and surname are displayed. In the phone book it is possible to use the filter for the type of contacts, for example, show only the contacts with phone number or the ones you have as friends in Facebook. On the one hand it can be useful and convenient, but … If you have pictures added to many contacts (which is the case with me) after the synchronization with Facebook they will be substituted by the pics from this social network, which may not be universally applauded. 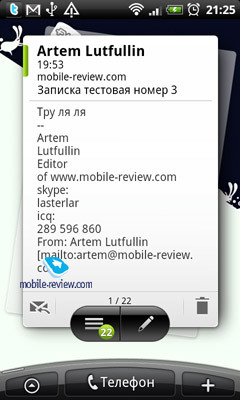 Contacts can be scrolled in the right side and the top part of the screen will feature the current letter. 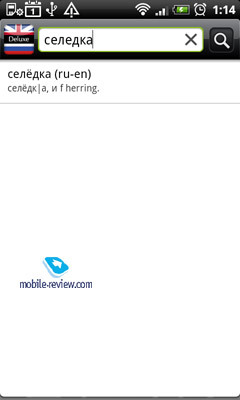 If you set the Russian language the letters will only be in the Cyrillic alphabet, which is a bit of a disadvantage. The search in the phone book is carried out in the main field (name and surname). The number of entries is unlimited (rather than by the phone's memory), the contact card has several main fields: phone number, mail address, ringtone, picture (can be assigned to every contact) and social networks names. Other information can be added optionally. Choose additional data field and add other phone numbers (office, home, fax, etc. 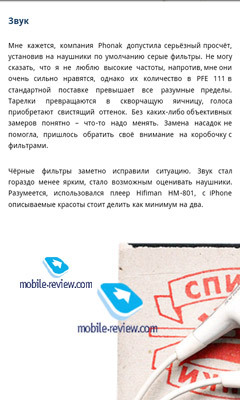 ), addresses (home, work), designate names in messaging services (MS Live, Skype, ICQ, QQ , etc.). New Sense has linking feature for contacts. 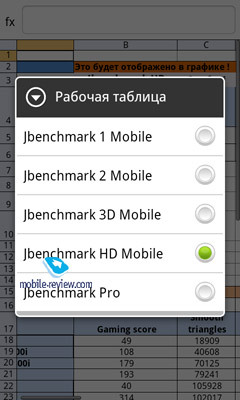 This option was added in Android 2.0, but in standard Android it is not so easy to use in comparison with Sense. In Android you have to enter the contact card and press Menu > Edit, Menu > Join and only then you get access to linking settings. 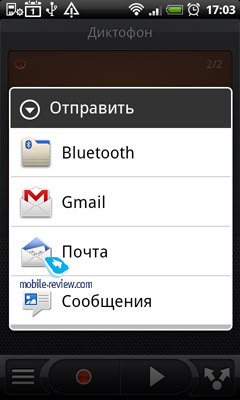 In Sense you open the contact card and see the icon in the right top area responsible for the linking dialogue box. What is linking? You can take one contact and couple it with another to display these two contacts in the phone book as one: one picture, common ringtone, one contact window. 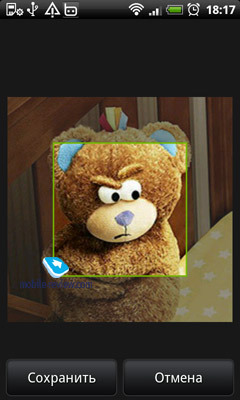 The picture of the selected contact is retained while the picture of the linked one is deleted. One can think of numerous ways to use the feature and the first one is to unite contacts of married acquaintances. You assign them a common picture and even if they have different surnames there will be no problems during the search – when you find one contact, the second is there as well. During linking you can always exchange the main and the linking contacts. You can also switch between the two pictures. 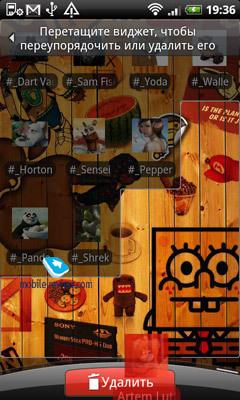 The bottom area of the screen has a menu in the contacts window with all phone book bookmarks. 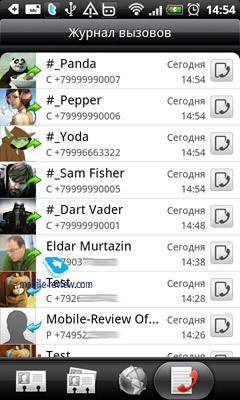 From the contacts list you can go to Groups, the menu with Internet contacts (for example, friends in Facebook or people you follow on Twitter) and the Calls Log. In the window of the selected contact there is a menu with the following elements: main information on the contact, history of text and mail messages, user messages in social networks, user pictures and calls history. 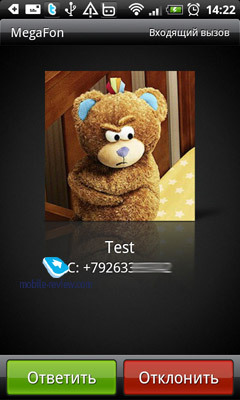 The user can see the activities of this contact in its card without entering any other menu (messages, calls history and mail). This approach is obviously very convenient. Any contact can be transferred to another one as a vCard and assigned any numerical key for quick dialing. 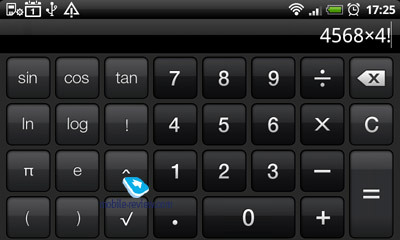 In the numerical keypad you have to press and hold the selected key (let's say 3) for several seconds to start the dialing of the assigned number. The contacts can be assigned pictures in the phone book differently. 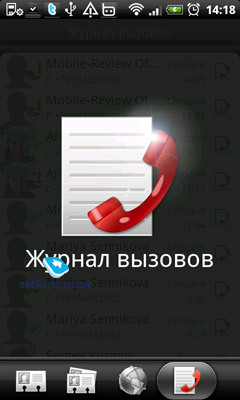 You synchronize the phone book with your Gmail and the pictures are taken from Gmail. They look awful. 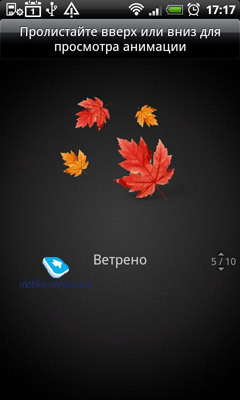 You synchronize the phone book with MS Outlook by means of HTC Sync. The quality of pictures depends on what you have in the Outlook address book. You assign pictures to contacts manually after the phone book has been synchronized with any source, which is the most correct option for the best quality pictures from the gallery or taken by the built-in camera. They can be cropped when you assign pictures to the contacts. If all people from the phone book are added as friends in Facebook you are especially lucky. Activate Facebook account on the handset and all friends pictures from the social network will be automatically assigned to the corresponding contacts in the phone book. In Sense you can create any number of groups and the contacts are added by ticking the necessary names in the phone book. The key feature of groups in Sense and in Android in general is an option to arrange the mass texting or mailing to all members of a group and in some situations it can be useful. The group can be assigned a separate picture, which can be renamed or deleted, but unfortunately you cannot assign a ringtone to the group. It has not been fixed in the new version of Sense. The menu with the calls history in Android is not the most convenient and new Sense offers nothing new. 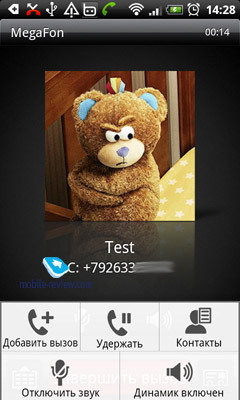 Types of calls (outgoing, incoming and missed) are displayed with an icon in the right side of the contact's mini picture and all calls are given as the general list. You can launch a menu and filter to show only one type of calls. Calls from one contact cannot be united in one line, so if you call somebody ten times during one hour you will have ten lines with calls to this person. The same applies to incoming and missed calls. It is difficult to navigate in this chaotic environment, which is slightly helped by an option to view incoming or outgoing calls separately, but it is not an ideal solution. I could not count the number of saved entries in the log due to their multitude. 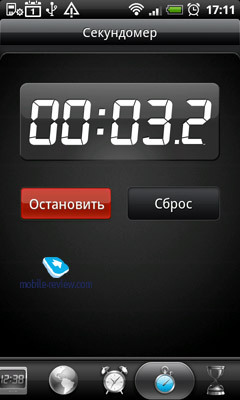 For example, in HTC Desire I have the history of calls since March 31, which is more than 150. If in the calls log you click a contact's card you will access the detailed list of appropriate calls and it is very convenient. If the screen is blocked, the information on a missed call is displayed under the unlock arc and in the top information line. During the unblocking the information remains in the top line and to launch this window you should drag the panel down from the top of the screen. In the system bar, when stretched to the full screen, the icon of a missed call indicates the total number of missed calls. 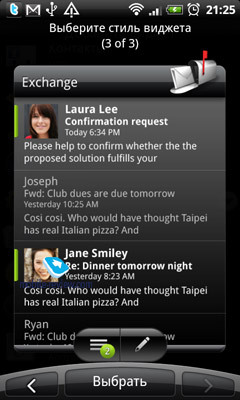 Sense offers several ways of displaying contacts on the home screen. Activity icon. Add the contact to the home screen as a shortcut, which is an activity icon. When clicked it activates a selected activity – a call to the mobile or landline number or a text message. The only disadvantage here is one picture for the contact and it is taken from the information on the contact. 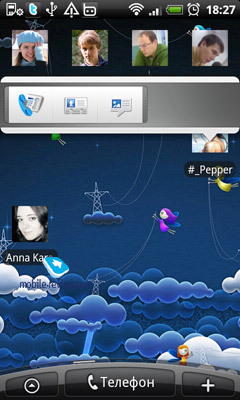 It is impossible to differentiate between the icons of outgoing calls and messages rather than by reading the explanations to icons ("Call" and "Write a message"). 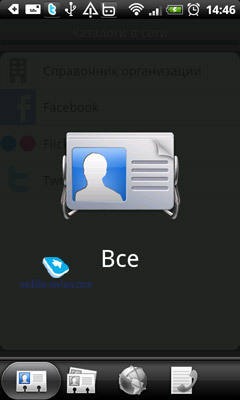 Contact card icon. 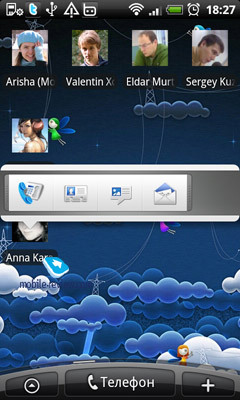 Add a contact icon to the home screen to open a contact card with one click. From the card you can make calls, write text messages, send mail, etc. 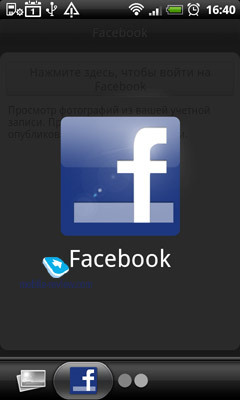 Quick access icon. This is a standard feature of Android 2.1. Add a contact shortcut to the home screen to open a small popup menu with icons of main number call, text or mail message and contact card opening. It is extremely convenient. Widgets. 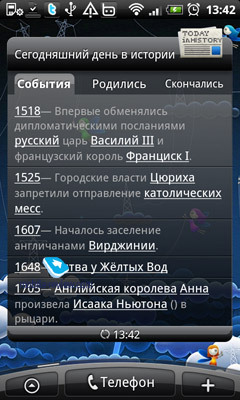 The last variant of placing contacts on the home screen offers two widgets: a panel (1/2 screen size) with quick access to the selected group contacts or a full sized widget with the icons grid. 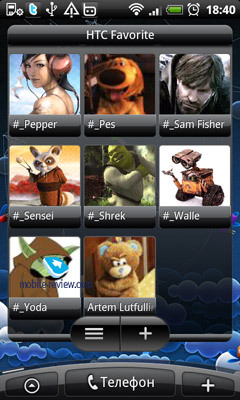 In both cases you can scroll down the contacts if they are too numerous and cannot be viewed in one widget at a time. 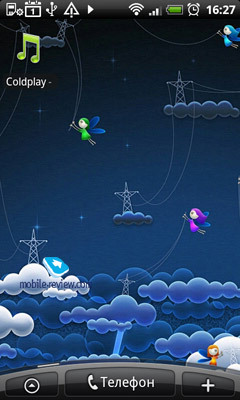 Every widget has a common scheme of start operation. When you add a widget you are offered to indicate the group of contacts to be added. It is strange, but you cannot start by adding the contacts from the phone book. If you do not have groups, create an empty one and add it. 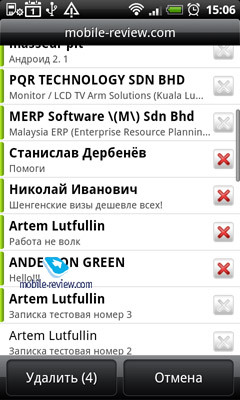 Then the widget will appear on the screen and you can add there all contacts from the phone book. Remember, that the widget shows one group and all contacts you add to it will be automatically added to the group. It is reasonable to create the Favorites group and select it when adding the widget to the screen. 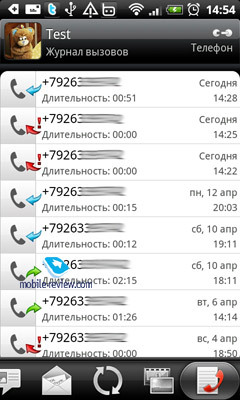 Each contact can be assigned a default в activity. 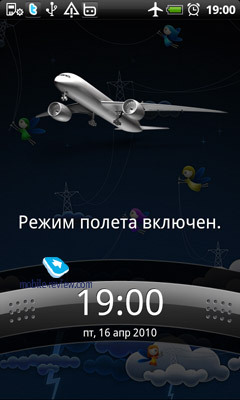 It is performed when you click on the contact picture in the widget window. If you click the contact name in this window you will go the contact's profile. After you add the group of contacts during the first click on the contact photo in the widget you will be offered to assign a default activity to every contact. The system works well apart from the fact that first you should add a group to the widget and separate contacts can be added only afterwards. 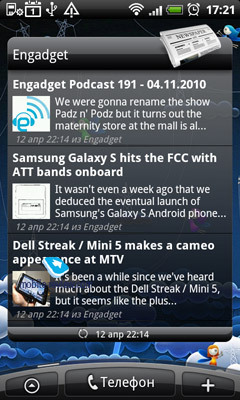 The number of widget panels is not limited and depends only on the amount you can squeeze into all screens. The number of icons on one screen is limited only by its free space. You can place different icons of one contact together: activity icons, profile access shortcut, quick access icon and the widget. There are no limitations for that. You can fill all seven screens or choose one for contacts icons. Choose the most convenient approach and determine the number yourself. To move icons around press and hold it for 2 seconds and then drag it where you need. Press and hold "Delete" and it is gone. Android 2.1 has not received any type of profiles. New Sense offers an improvement in this respect. Though you still cannot create your own profiles it is possible to choose from three standard ones: normal, vibration and silence. Profiles can be selected from the settings for "Sound and Screen" or by holding the off button in any menu. In the second case you open a popup window to choose a profile, activate/turn off the Flight mode and data transfer via mobile networks. In the settings you can choose volume levels for calls and multimedia (music, radio and video). The call volume can be similar or different from the notification volume. The main pattern of synchronization for Android devices is the phone – Internet, or to be more precise: Android –Google services. 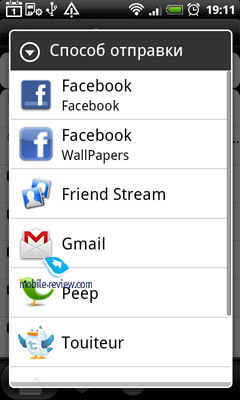 If you do not have a Google account it can be created from any Android handset. If you already have it – just enter the necessary data. During the initial customization you will be offered to choose the components of the account to be synchronized. Ideally, users choose all profiles (mail, calendar and contacts) and receive a ready environment, but only if Google account is used to store contacts details, create calendar events and maintain the phone book. By the way, even if you store all contacts locally, let's say, in Outlook, you can transfer the entire database to Gmail within 10-20 minutes. Synchronization with Google services is convenient because you can create events on PC or a laptop, edit them in the browser and all data are immediately updated on your smartphone. When you create an event in Google Calendar it appears in the phone within seconds. It also works for contacts. When they are edited on the server information is updated on the phone. 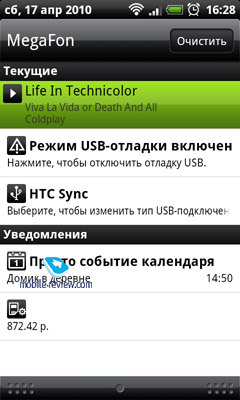 HTC smartphones offer one more way of synchronization with the help of HTC Sync, which is installed on the PC. As a rule this software comes in the box on a memory card. If it is not included or is outdated you should ask HTC support for a new one. 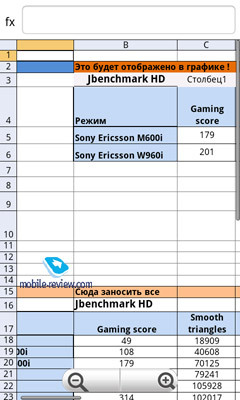 Unfortunately, I could not find the download page for this application on European and Russian websites of HTC while on the US site everything is easily available. 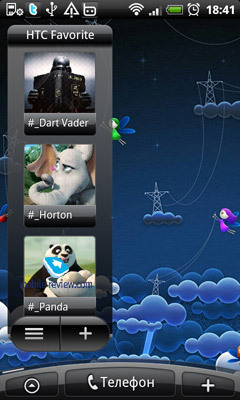 For example, the version for HTC Hero. 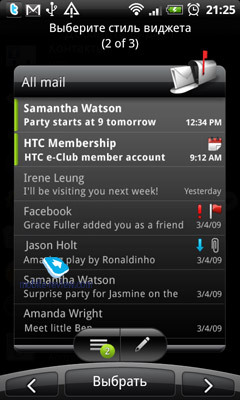 HTC Sync helps to synchronize the contacts and calendar between your smartphone and PC. You can synchronize with address books of Outlook Express or MS Office Outlook. You can do it manually or choose settings for the automatic synchronization. 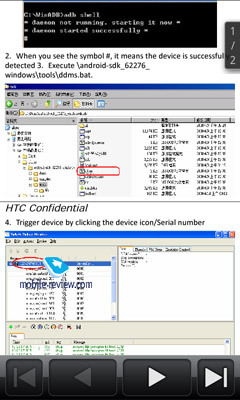 Apart from that, HTC Sync can install new software onto the smartphone in the form of .apk files. The application is simple, all features and settings are intuitive and can be easily customized. Surely, you cannot compare HTC Sync with such monsters as Nokia PC Suite (now Ovi Suite) or Samsung PC Studio, but it is not bad to have an application with basic synchronization features. 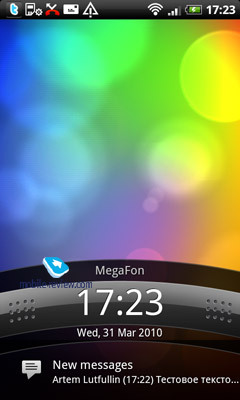 When the screen is blocked new text messages are displayed in the lower part of the screen under the unlock arc and in the information line above as an icon. The field under the lock arc shows only text and multimedia messages, while mail messages are not visible here. 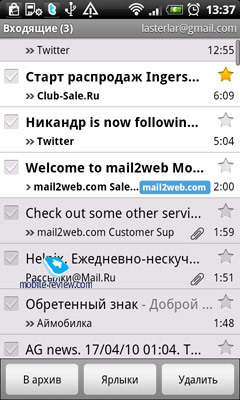 Text messages in the information line are represented with an envelope icon, e-mails from Gmail have an icon resembling the logo of this mail client, other mail applications use a special envelope. When you launch the information line you see the number of new (unread) text messages and e-mails. To the right from each line you see the time when the last message of the type was received. There are several ways to display separate messages or their total number on the home screen. 1. An icon of text messages and e-mails on the screen. Every mail icon (except Gmail) displays the number of messages every time you receive new ones and you can see the number of new messages of every type right away. 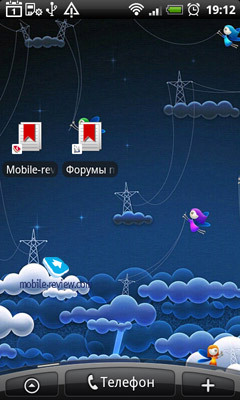 Besides, you can choose separate icons for different accounts, for example, one for office mail, another for Yandex, Mail or Rambler. 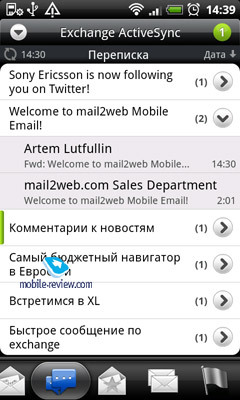 The main convenience is that you can know the number of new messages in different mailboxes without entering them. 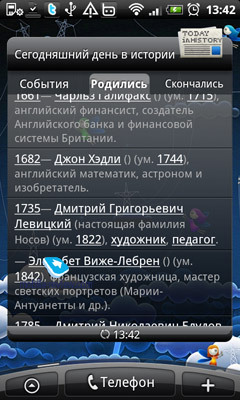 Text and multimedia messages are displayed together. 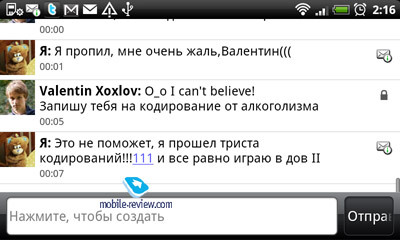 In the corner of the icon you see the total number of new messages (SMS and MMS). Unloaded multimedia messages are shown in the information line by an envelope with an exclamatory mark. 2. 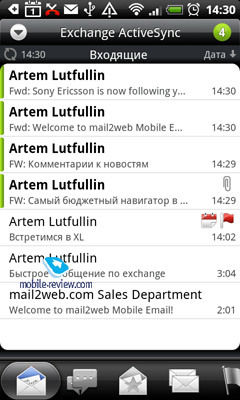 The second way of the mail display on the screen is the use of HTC widgets. 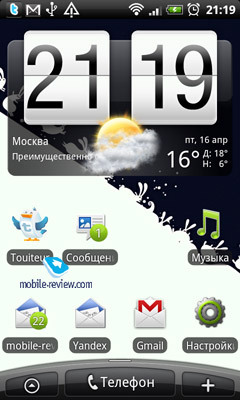 Three widgets are available. The first one represents pages with mail messages, which can be browsed with a finger. 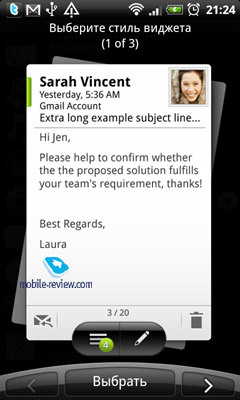 A similar mail widget was used as early as in TouchFLO 3D. 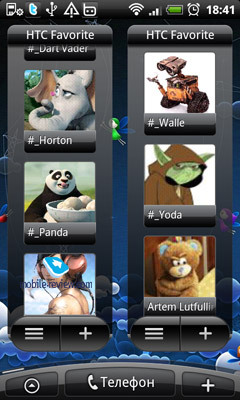 The second widget shows the list of recent messages with the indication of authors and subjects. New messages are given in white font and have a green line to the left. Once read, they become shadowed. And finally the widget number three uses the list of latest messages, but apart from the author and subject it displays a part of the message and the picture of the sender, if he has been assigned one. All three widgets have almost a full screen size and if you locate them on any given screen (out of 7) there will be no free space left. The algorithm of operation is the same for all widgets – in the lower part of the widget over the icon of entry into the mail window you see the total number of new messages and the icon of new message is to the right. To my mind, mail widgets in Sense still remain quite useless among other relatively convenient mini programs (I do not take into account widgets like "day events" or "tips calculator"). 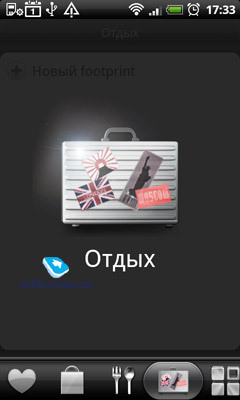 These mini programs do not allow any meaningful operations with the correspondence apart from browsing the list of messages, opening any of them and the icon of new messages. 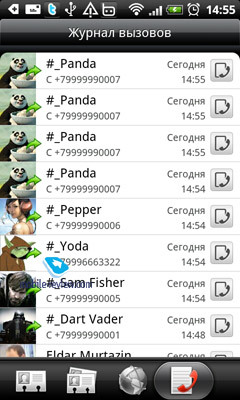 Text messages are represented by the list of chats. On the screen with 480x800 resolution you can have up to 9 chats. The chat is all correspondence with a particular contact. In the general messages window to the left of every chat you see a contact's picture, a bit to the right comes the name and below the first lines of the latest message (around 35 symbols with spaces) and the time of sending. The latest message can be both incoming and outgoing. New SMS and MMS are marked in the chats list by a circle with the figure inside, which denotes the number of unread messages. When you open the chat you see all correspondence with a contact. To the left we have a contact's picture (if not assigned a head silhouette will be shown), to the right come the name and the message text. Besides, under each message we see the time of receipt (or sending – for your answers). It is represented as a chat with older messages going up and new ones added at the bottom. For every message within a chat you can access the details (date and time or receipt). The chat is divided into blocks. One block represents one day of correspondence. The blocks are separated by black border lines and above each block you see the day of the week, date and year. The same chat window is used to write new messages. You can write and read messages horizontally and vertically. 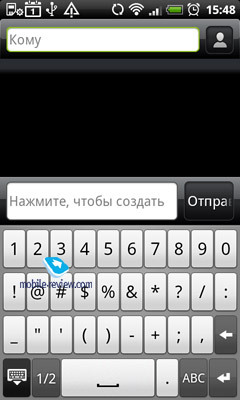 When you turn the smartphone the screen and keypad orientations are changed automatically. Any message within the chat can be deleted. The same applies to the entire thread and it can be done with one click. Separate messages can be blocked. 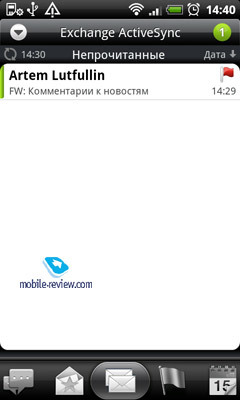 If you block it then such a message cannot be deleted even if you delete the whole correspondence with this contact. Anyway, you can tick "Delete blocked messages", and the whole thread could be deleted. Every message within the chat can be sent as a text, mail or multimedia message to another contact. When you create a new message it is a text one by default. If you add a picture, ringtone or other content to SMS it will automatically switch to MMS. Text messages are turned into MMS when you exceed the limit of bonded messages. 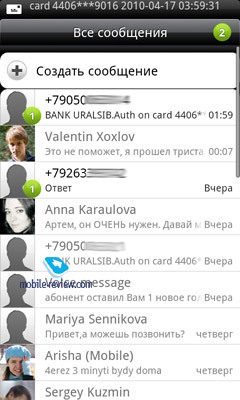 If one message has more than 5 SMS (5 messages of 70 symbols each for the Cyrillic alphabet) it is automatically transformed into MMS, which is indicated by a notification over your message. The calculation of symbols is not very convenient in Sense and Android 2.1. 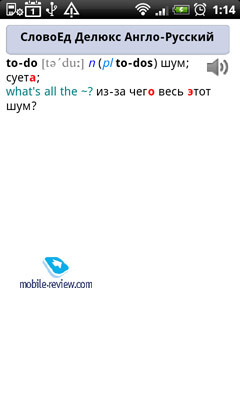 To be more precise, there is one complaint here – the number of entered symbols is visible not right from the beginning when you start typing SMS, but when you have ten symbols left until the first message limit (for the Cyrillic alphabet). During the first 60 symbols you do not know what lies ahead and realize only when you reach 60 symbols, which is inconvenient. The number of symbols is displayed above the "Send" key and the forward slash shows the number of bonded messages. In messages settings one can choose the notification when the message is sent and delivered. If the sending notification is enabled you will see an envelope with "i" accompanied by the notice "Message sent" in the system bar every time you send new messages. When you choose the notification on delivery you will see a similar icon in the right side of every sent message. The icon appears only when the message is delivered to the contact. In the menu the templates are available. They are called "Quick text". These prepared short SMS can be sent in different situation when you have no time, but have to answer quickly and the templates have a typical answer (yes, no, send me a message, etc.). The existing texts can be edited and you can add yours as well. The number of templates may be limited, I created around 20. I think it is possible to come up with more of them. If you were writing a message and then went to the main menu, clicked "Home", "Back" and so on, the message is saved in the drafts. Every time you can access the drafts and continue the unfinished message, which is very convenient. The settings also offer a useful option to delete old messages. You assign the limit for the number of messages and everything else, starting from the oldest, will be deleted automatically. The limit for the saved messages varies from 1 to 999. The same limit can be used for MMS. In messages settings you can also choose a melody for the new messages notification and another one to confirm the successful sending of your message to the contact (this option is not available in Android 2.1). The abovementioned events can also be accompanied by vibration as notification. 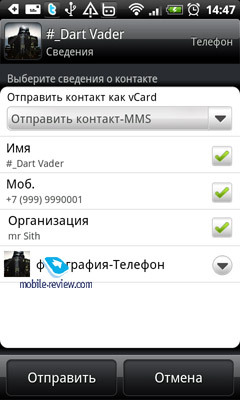 In the settings you also select SMS center and the automatic download of MMS after their receipt. And the last point as to the messages. If you send a message which fails to be delivered (when you send them in metro, tunnel or the network becomes unavailable) the system bar features the line with the notification of no delivery. If you click you will open a full size window with all unsent messages and details about the time when you tried to send such messages. The new version of Sense distinguishes between Gmail, Exchange and all other e-mail accounts, just as it was in the previous version. That is, user interfaces differ across the account types, which is especially true for Gmail and Exchange. Hence we will take a closer look at each of them. Gmail. The messages are shown as a list; there can be up to 8 message rows (entries) on a screen with a resolution of 480x800 pixels. Each row contains information about the subject, sender (or feed name) and date received. On the left-hand side, there is a selection checkbox; if you select one or several messages, you can then label, archive or delete them. 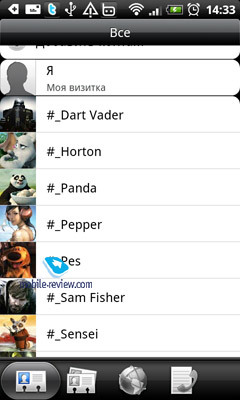 To the right of the subject and sender, you can find the Star mark that allows you to add messages to the favorites. 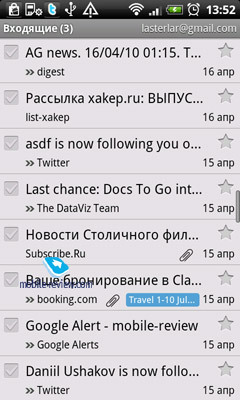 Unread messages are shown in bold in the mailbox. Messages with attachments have a small icon and filename at the end. In case the attached file is supported by some program, it will be denoted by the corresponding icon; otherwise, you won't be able to do anything about it, even to save it somewhere else. The issue hasn't been addressed in the new version of the OS. 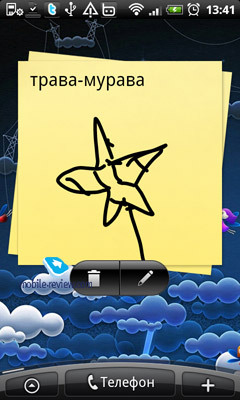 If there is an image in the attachment, and the format is "known" to the device, it will then be displayed right in the message body below the sender signature. To view other attachments, such as documents, spreadsheets, or presentation slides, you will have to press the View button. The only real disadvantage of the Gmail account in Android 2.1 (in terms of functionality, it is the same in Sense) is its limited labeling capabilities. First of all, you are not allowed to create new Gmail tags or edit the existing ones via the Android account. Secondly, even if each of your labels has a separate color, they will all look the same on the smarthone. In my opinion, one of the most interesting and useful Gmail features gets lost that way. You can have several Gmail accounts on the device at a time, one of them being the main one, for which you can have e-mail, address book and calendar synchronization, whereas only address book and e-mail synchronization is supported for the rest. The mailbox is constantly updated (due to the Push mail technology). That is, a message will appear on the device in mere 10-20 seconds after it has made it to your Gmail inbox in the Web browser. Therefore, you cannot set any particular mailbox update time (it's simply not an option), message size for download, etc. for the Gmail account. The only few things that you can change are the message signature and notification type (you can enable vibration or select a separate tune for new Gmail messages). Gmail search works for the messages both downloaded to the smartphone and stored on the server. Moreover, if you are a Google Talk user, its data is taken into account, too. Once a keyword is entered, the list of messages that have one either in their subject or body is presented. If it was mentioned in a Gtalk conversation, the whole thread would be brought up, too. In my opinion, the search capabilities are more than adequate for work, the only puzzling thing being the fact that you can't search within the body of a particular message. The disadvantages of Gmail search are as follows: the search is not realtime but requires you to press the Search button; and the keyword is not highlighted in any way in the search results. Exchange. By default, Android 2.1 can talk to Exchange servers; the device supports push messages, yet the account functionality is comparable to that of an ordinary mailbox. Both the standard (save for Gmail) and Exchange mail are different from Android 2.1 in Sense. 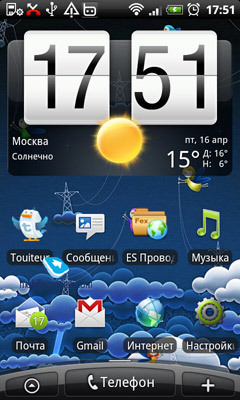 To be more specific, in terms of functionality, Exchange in Android is almost the same as in Sense, however, it is done in a more logical and convenient way in the HTC shell. You can setup the server name, domain, user name and password for an Exchange server. SSL encryption can be enabled, too. You can play with the mailbox update preferences – i.e. define the beginning and end of the push download periods; for example, you can make the device download new mail at the end of each working day and every morning. In Android 2.1, you can synchronize your address book with an Exchange server. Your mailbox will also accept invitations from other people as messages, since Android 2.1 does not support Exchange calendar synchronization on its own. In contrast to that, Sense allows you to synchronize e-mail, contacts and calendar with Exchange servers; you can tell the device to store the messages for 1, 3, or 7 days, 2 weeks, 1 month or forever, setup the display format (plain text or html) or the maximum size for download. In addition to that, you can synchronize the calendar events 2 weeks, 1, 3, or 6 months in the past or all of them, as well as set the maximum attachment download size (from 25 KB to 2 MB, or download all or none). If you choose to synchronize your contacts with the Exchange address book, the following options are available for the current address book: keep the phone contacts and add new ones from the Exchange address book or replace the phone contacts with the Exchange contacts. 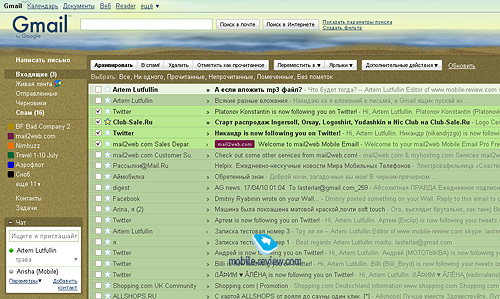 In terms of functionality, the mailbox itself is not very different from the standard account in Sense: the messages are presented as a list, with the new ones in bold and marked with a vertical green bar on the left-hand side. The subject and sender are displayed; for invitations – there will also be a calendar icon, for attachments – the appropriate mark, there. Any message can be tagged with a flag as important. 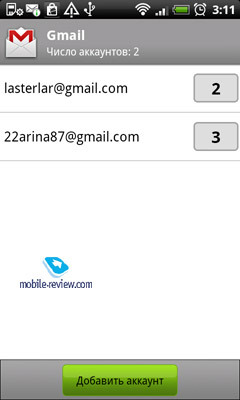 The latter, as well as invitations and messages with attachments, can be viewed separately in the corresponding mailbox tabs. That is not part of the default Android 2.1 functionality, which offers just a list of messages and star tags that are virtually identical to the flags. In contrast to Gmail, e-mail attachments from any other account can be saved in Sense regardless of whether the file format is "recognized" by the system or not. That is, if you receive a message with a .rar file on an Android device with Sense, you will be able to save it on the memory card (unless it's in your Gmail inbox). By default, Android 2.1 will allow you to save select attachments only (e.g. 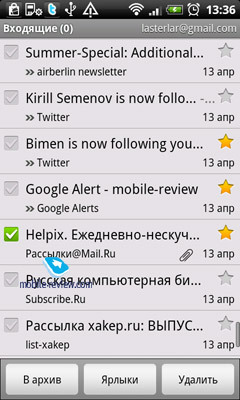 pictures) regardless of the account type (be it Gmail or any other mailbox). Messages in the html format are displayed just fine; one can scroll them horizontally, use multi-touch or gestures to zoom in our out. In additions to the tabs with the regular mail, attachments, flagged messages and invitations, there are also correspondence and VIP messaging tabs (from the contact group of the same name). 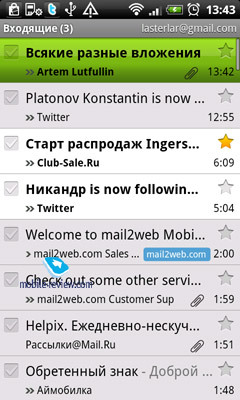 Both in the standard and Exchange e-mail accounts, one can adjust the font size in the message body from tiny to enormous; the same can be done with finger gestures while reading, though. The critical difference between the Exchange realization in Android 2.1 and Sense lies in the search capabilities. 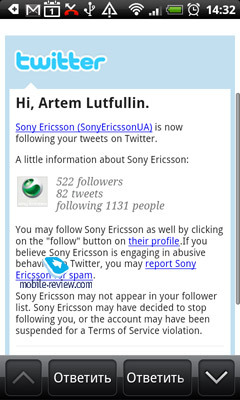 The latter is a serious general limitation of Android 2.1 that has been correctly addressed in Sense. 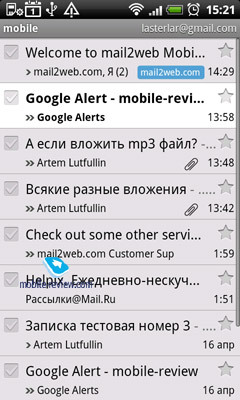 The thing is that Android does not have any e-mail search except for the Gmail account. That is, you can search for your Gmail messages but that is not an option for the Yandex, Mail or Exchange server accounts. Android 2.1 does not provide such functionality. 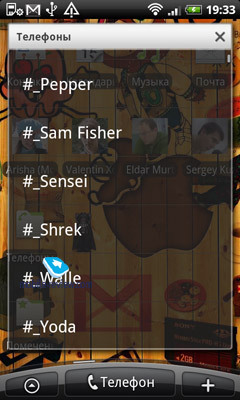 On the other hand, Sense allows you to search in the basic e-mail and Exchange accounts. In the latter case, you can even search for messages stored on the server (say, archived correspondence). Search works in the sender and subject fields, not in the text body. It is realtime, that is, the search results get updated and irrelevant messages go away with every new character entered. The keyword is highlighted in green in the messages, which is handy. 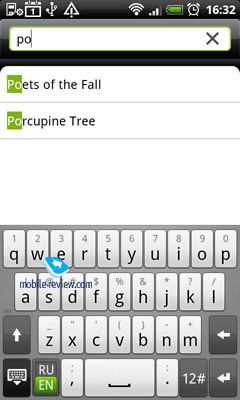 There is a dedicated smartphone button to initiate search (any Android device has it). 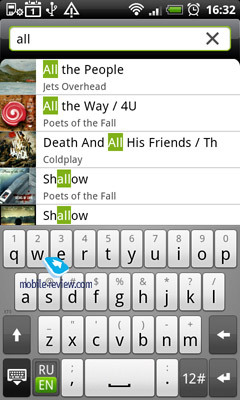 Both in Android 2.1 and Sense, there are two search modes for many menus. 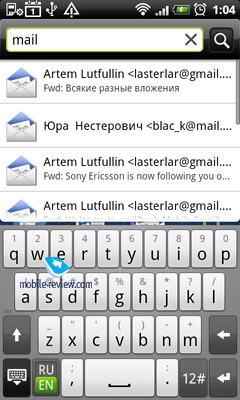 For example, for e-mail, it is mailbox search and quick search (looks for the keyword everywhere – i.e. in user files, contacts, messages, programs, on YouTube, etc.). To switch the mode (where there is more than one), just press the Search button once more. It is paradoxical that with all the usability of HTC Sense in terms of handling the Exchange mail, I could not find a way to change the name of the account and thus believe that it simply isn't allowed. 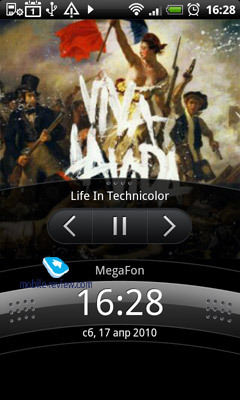 Such feature does exist in Android 2.1 by default, though. Generic accounts. Everything said above about Exchange is true for that mailbox type, too. The only difference is that there are no tabs, flagging messages or invitations for generic accounts. The messages are presented as a list, there are 8 items on the screen, and the new ones have a green vertical bar on their left. The name of the current account is displayed at the top of the screen (you can switch to another mailbox from there). The messages can be deleted either one by one or several at a time upon selection. You can also delete all of them at once (also works for the Exchange account, but not for Gmail, where you will have to select the messages one by one anyway). In addition, you can define the time period and days of the week for that schedule (download frequency). By default in Android 2.1, the message download frequency is less flexible (from 5 to 60 minutes). By the number of messages (20, 40, 60, 80, 100, or 200 messages). All said about the e-mail display in Exchange above is also true for generic accounts. The mail client(s) can display both plain text and html messages. In the latter case, the main text is justified in one column, which makes it easier to read regardless of the screen orientation. You can also disable pictures in such messages and use both the portrait and landscape orientations in any e-mail account. There it is, right out of the box, one of the most notable features of Sense that Android 2.1 and other mobile operating systems lack. Before we get into details, I want to make it clear that the feature works in any e-mail account (including Exchange) but Gmail. It must have something to do with the fact that HTC is using the Gmail applet from Google without the rights to modify it unlike the other e-mail accounts. You can select words or blocks of text when reading a message. To select a word, just hold your finger on it for a while – and you will see the pop-up menu, from which you can copy the word to the clipboard, send it to Twitter, via e-mail, text message or Friend Stream. Naturally, the same is also true for word combinations. To select a phrase, highlight one word first and then drag one of the quotation marks to the end of the required block. Now comes the main feature – i.e. 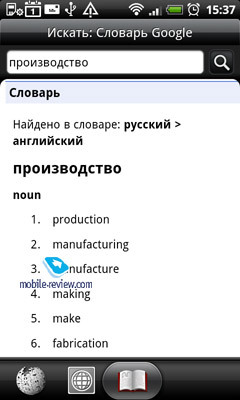 the ability to translate the selected word or phrase or even the whole text using Google Translate. You can choose any language from the list of those supported by the service. 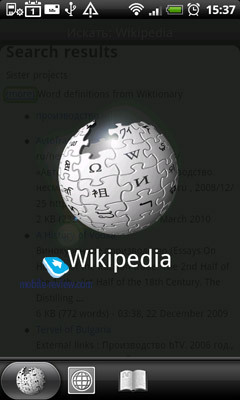 If just a single word is selected, the feature allows you to look it up on Wikipedia (in the current language but works for any) in addition to the Google dictionary. 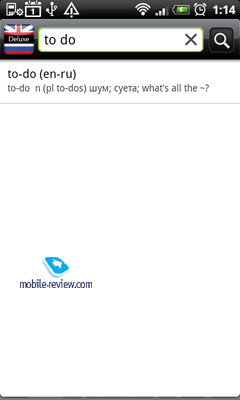 In my opinion, that is an incredible feature, which can significantly simplify one's work with e-mail sometimes. Compared to the previous version of Sense, the on-screen keyboard is practically the same and has several working modes: full format QWERTY, compact QWERTY and the regular alphanumeric keypad with 3-4 characters on each key. 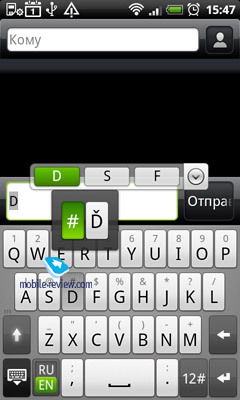 The keyboard preferences can be accessed by holding the layout change key. 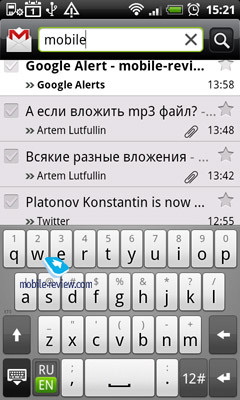 When typing, the most recent character is displayed in a pop-up menu above the corresponding key, which allows you to control the input even if your finger is blocking the view. If there are special characters on a key, you can hold it for the list of those to appear in the pop-up menu (whenever there is just one extra symbol, it will be input automatically). If you hold the key, which switches the input mode to special characters, the most popular of them will appear in the pop-up menu. That is, you can pick some symbols right from the menu, with no need to switch the input mode. Text input is accompanied with slight vibration. The effect helps to get used to the sensor keys, which cannot be felt unlike the hardware keys. You can also enable the key press sound notification or even have both feedback types at once. The keyboard is context sensitive. For example, the full format QWERTY has a comma symbol on the left of the spacebar if you are composing a text message and an extra key for the domain zone (.com) if you are browsing the Web. 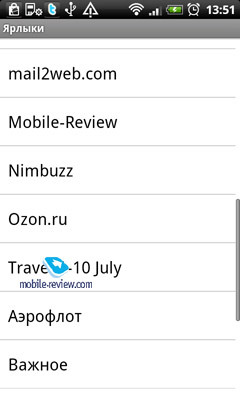 If you tap and hold that key for about a second, the list of first-level domains (i.e. 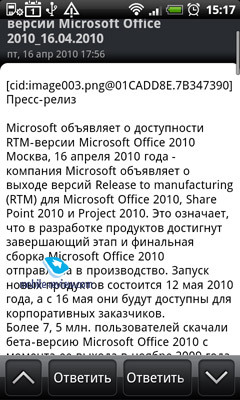 .ru, .org, .net) will pop up. Let's take a look at the alphanumeric keypad. It only works in the portrait mode; tap and hold for numbers, tap a certain number of times for a particular letter. The special characters (! 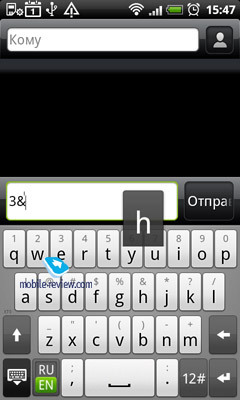 ?.,@') do not require you to switch to the auxiliary keyboard in any language but you will have to do that for the rest. Compact QWERTY keyboard. It only works in the portrait mode and has 14 keys with 2 or 3 letters on each. 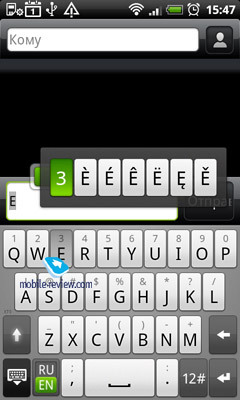 The aforementioned special characters can be input immediately (in any language) but you will have to switch to the auxiliary keyboard for the rest. Both keyboards also have a key that switches the T9 mode, which is handy. 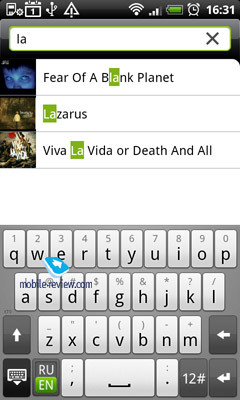 The full format QWERTY keyboard supports both the portrait and landscape orientations. In the latter mode, it also replaces the other keyboards. T9 works as a charm in the new version of Sense. Personally I don't use it for text input, but decided to give it a try as a quick test. When typing, the system always had the necessary word in the suggestion list and can therefore be considered as a viable input aid. 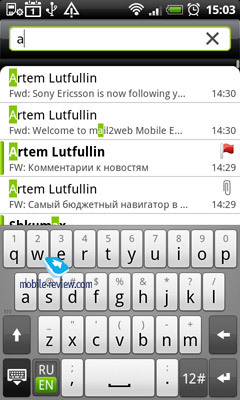 For the full format QWERTY keyboard, there is also a word auto-completing feature (similar to the one that has been used in Motorola phones for a while) that suggests various endings for the word you are typing at the moment. The vocabulary gets constantly updated with your input history, making the whole framework even more useful than the regular text input or T9 over time. 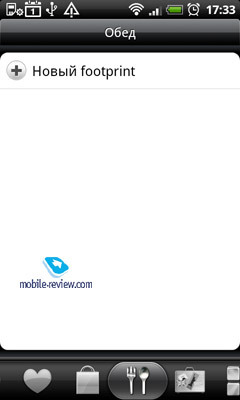 The topic has received hardly any attention in Android reviews (I admit that that is partially my fault, too), and therefore I would like to talk about the search options in this Sense review. As you know, Android has global search capabilities. 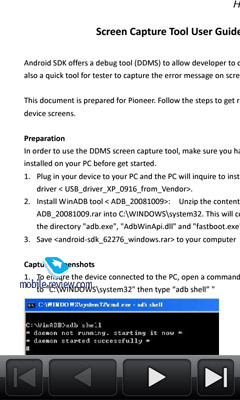 All-in-all, the idea of a full-content search on a device is not novel and has also been available on Windows Mobile communicators and S60 for a long time. 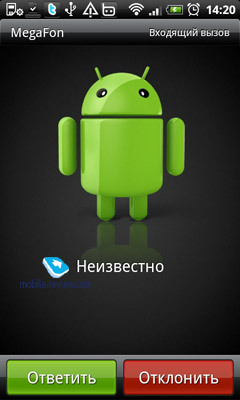 However, there it works in a very crude and clumsy way, whereas the Android implementation is much wiser. That is, Android 2.1 includes contacts, browser, applications (their names), music and YouTube in the global search, and HTC Sense has that list significantly expanded (twice as many options), which makes the feature even more useful. In addition to the aforementioned elements, HTC Sense allows you to search in messages (text, multimedia and e-mail), preferences, inside calendar events (event name, place and description), and in Footprints, albeit the latter option is not interesting. The benefit of having such extra search options is obvious. Say, you remember writing an important message to your friend but cannot find it in the general mess. Moreover, you can't even recall whether it was a text message, e-mail or just a note in the calendar for a particular day. What you can do is try to remember some word and look for it in the global search. It is very likely that the message will be pinned down in 20 seconds. In addition to that, the global search works for many default programs (both in Sense and Android 2.1). 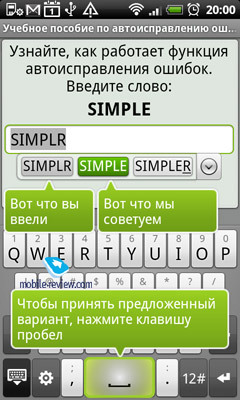 For example, having installed a dictionary on the smartphone, you can add it to the search options by checking the appropriate box in the preferences. 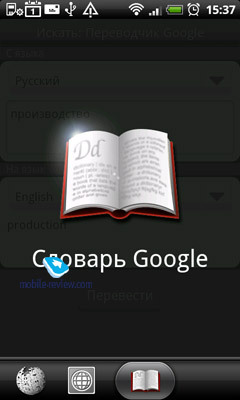 I downloaded SlovoEd and enabled it in the global search. Now, whenever I press the Search button and type a word, I get its translation among the results. That is very convenient. It would be even better if there was no need to go to the actual program for details (smile). Apparently, the latest version of Sense is practically the same there. 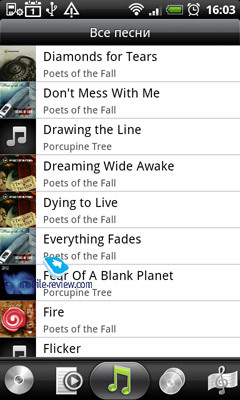 At least, I could not see any differences from the previous version on the music player side. A library catalog of artists, albums, playlists or individual songs defines the core of the player. During the playback, the album picture, current and remaining track time, as well as its title and the artist's name are displayed (fullscreen mode). One can go back to the library or current playlist at any time. One can also look up the properties of the file, send it over Bluetooth or assign as a ringer tone. In the latter case, the track can be cut shorter. 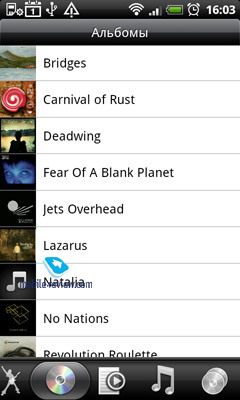 If the playlist consists of tracks from various albums or groups, they are displayed as a series of album pictures on the main screen, so that one can not only use the Previous/Next buttons but also scroll the pictures to the left or right to choose another track in the sequence. There is no equalizer in the player. 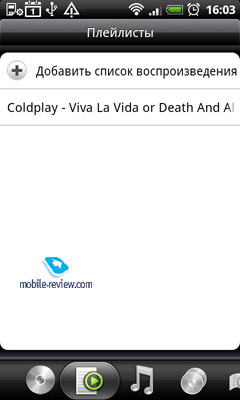 In contrast to the default Android player, the one in Sense cannot look up the current track on YouTube. 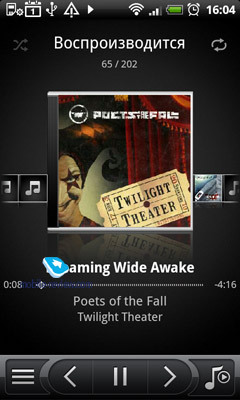 There are three desktop widgets for the player, the default one and two from HTC. The latter display the album picture, scroll dial, control keys, and only differ in size, one of them taking up the whole screen and the other – just half of it. In addition to the widgets, one can create a desktop shortcut to the player or, which is more convenient and interesting, to any playlist. That way, you can start the playback of a particular music selection just by clicking a desktop icon with no need to launch the player first. Apart from the desktop (if there is an appropriate widget there), the current playback information is displayed in the system bar. 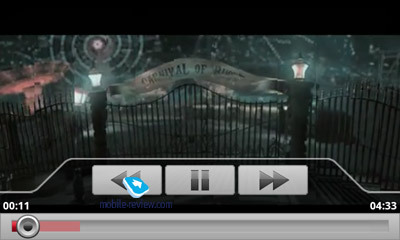 The list of nice features of the player also includes the ability to pause and resume playback while the device is on hold without unlocking the screen by simply turning it on. 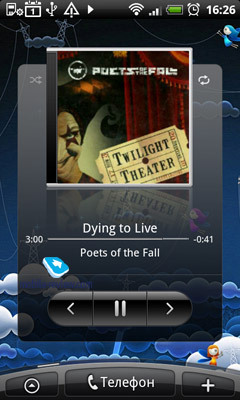 Both during the playback and lock mode, the album picture and player control elements are available. Another feature is the ability to adjust the volume using a hardware button with the screen off (true for any Android device). Music search parameters depend on the current catalog section and the process is initiated by a press of the button of the same name. If you find yourself in the artist section, you will search by their name; the same is true for albums, individual songs, original artists, playlists, etc. In addition to search, you can simply browse through the list. In that case, you will see the current letter at the top of the screen. Sense has a bug there, though. The thing is that if your current device language uses some non-Latin alphabet then the letters will be displayed only for that portion of the list where the song titles are in that very language. There won't be any letters for the titles in Latin there. Everything is normal again if you switch back to English, though. In my opinion, it is not very wise of HTC to continue replacing the standard Android album with their proprietary solution in Sense. For example, there is some evidence that Samsung is going to keep the default album application in its future Android devices simply because it is handy and functional indeed. 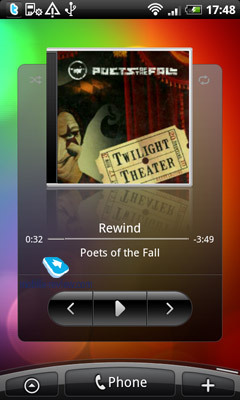 HTC's album comes from earlier versions of Sense and looks simpler and less impressive than the one in Android 2.1. 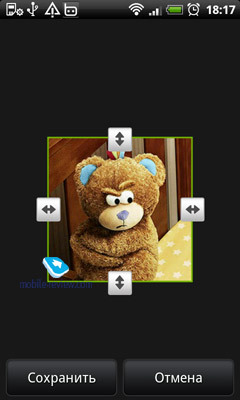 One and the same application is used for both photo and video. The content is presented in three categories: photo and video, as well Facebook or Flickr data if you have the corresponding accounts. 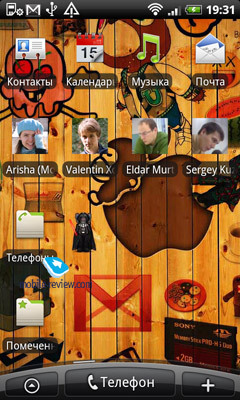 Everything is organized into folders but one can also browse through all images (pictures, photographs, etc.) at once. In that case, the date of a photograph or picture will be displayed at the top of the screen with the more recent located down the list. To delete images, press the Delete button and choose those you don't like anymore. You can delete all of them or all in some folder (just open it, press Delete, then Menu and Delete All). From the album, any picture can be sent as an e-mail attachment or to one of the aforementioned services, set as a desktop background (can be cropped right away) or assigned to a contact. 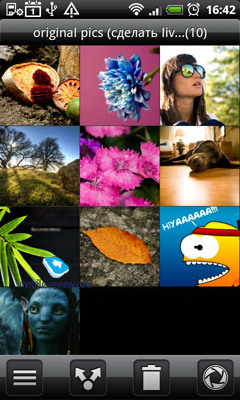 The photos can be viewed one by one in the horizontal mode or as a grid, 12 at a time (480x800 pixels resolution). There is also a basic slideshow mode available. 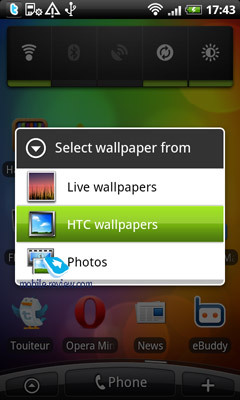 HTC provides widgets called "Photo Frame" and "Photo Album" for your pictures. 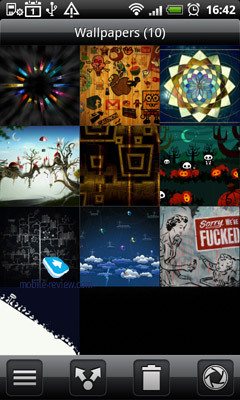 Choose one for the former (it will be adjusted to fit the screen estate) or the whole folder for the latter. Both widgets are absolutely useless, though. 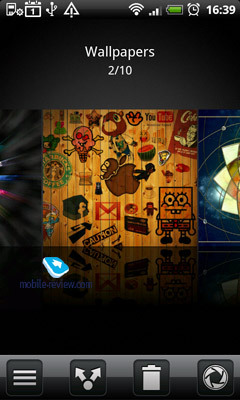 The album also allows you to watch videos, although the functionality is very basic, just the playback and rewind for Android supported formats. 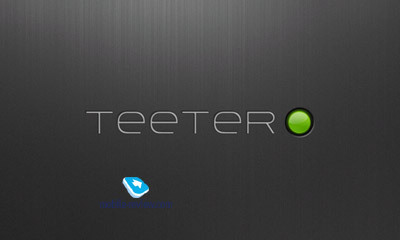 There is one game provided with Sense for Android – Teeter. 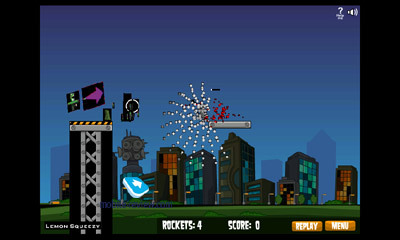 Familiar to Apple iPhone users, the game asks you to guide a ball through the maze and reach the end zone using the built-in accelerometer. By the way, the number of levels is now more than 26 (I believe that is how many there were before). For YouTube, Sense uses an application absolutely identical to that in Android 2.1. It compiles the list of the most popular and watched video clips, allows one to look up new feeds using categories or the traditional search. During the playback, one can select the video quality (HD or regular), add the clip to the favorites or send it as a link via e-mail or to Twitter. If you register with the service, you will be able to take the video with the built-in camera and immediately upload it to your channel. No need for a camcorder with direct YouTube video upload. For convenience, the application supports video categorization and sorting by time. You can also have access to video comments. Here, I am going to describe applications that come with any device (well, almost; to be specified in the actual product review) featuring HTC Sense. Friend Stream. 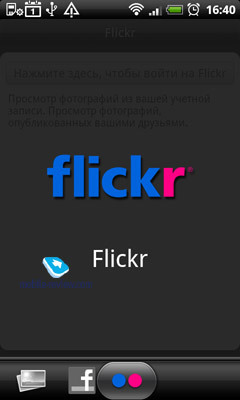 The program merges messages from Twitter, Facebook and updates from Flickr into a single news feed. In my opinion, the utility is one too many taking into account the fact that Sense has standalone Facebook and Twitter clients. However, it may be to someone's liking, especially, if one uses Twitter together with Facebook and Flickr for some reason. Dictaphone. 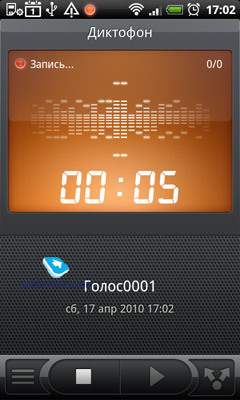 It is a basic voice recording application. Just run it, say something – and you get a voice memo. Any record can be sent via e-mail, over Bluetooth or as a multimedia message. The records are displayed as a list. You can also turn on voice recording while talking on the phone. However, keep in mind that the conversation will be recorded using the built-in microphone and therefore you may not hear the other side as clearly as yourself. Nevertheless I would like to point out that the recording quality is fairly high, there isn't any noise or hiss there. Hence if there is no alternative, the voice recorder in Sense can be used. Still, you will have to increase the volume level in order to make out what the other side has said. Any voice record can be renamed or set as a ringer tone. Desk Clock. Sense comes with its own clock application. 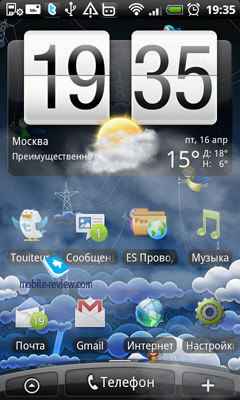 Just as the standard Android 2.1 utility, it can be set to the battery saving mode. 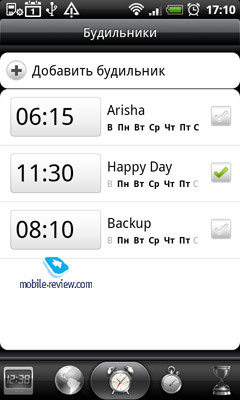 There are several handy alarms with a separate schedule and notification type each, timer and stopwatch (both work in the background), as well as world time there. Weather. Self-explanatory. It is a gorgeous weather widget and a program of the same high quality with stunning effects, four-day forecast, and support for a large number of cities (I stopped after 16 and can't say what the limit actually is). News. It is an application that collects news from various sources, technically, an RSS aggregator that can handle your favorite RSS feeds. 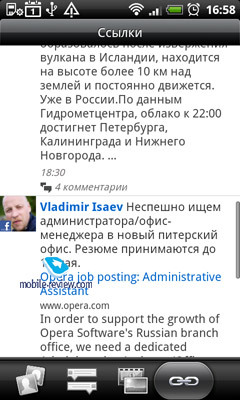 It allows you to import those from a file, which can be easily generated by Google Reader, for example. Just open Google Reader and transfer all your feeds to a file and from it – to the program. 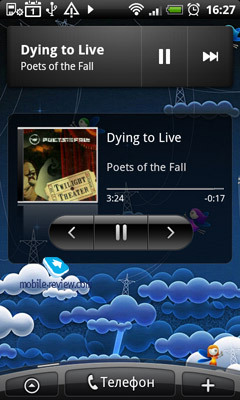 In addition, HTC provides two custom widgets, for the fullscreen mode and a compact one. 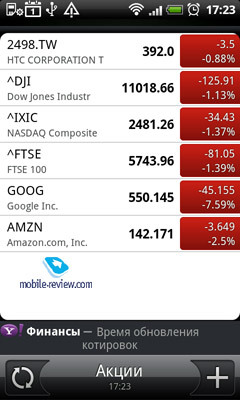 Stocks. 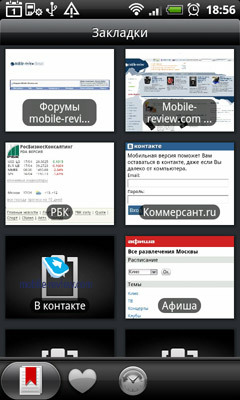 Familiar to HTC WM device owners, this application allows you to follow stock and portfolio quotes of select companies. Hm, everything looks sad on the screenshot, dropping down. Calculator. 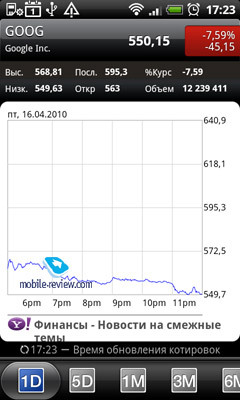 No comments there, just take a look at the screenshots. Footprints. 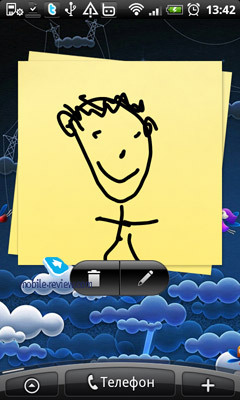 It is an application that allows you to create notes with photographs from various places during your travels. QuickOffice. 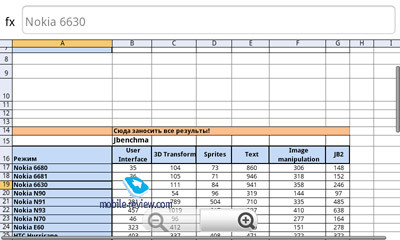 It is a standard office suite for HTC, which allows you to open even the latest Microsoft Office formats – i.e. docx, xlsx. There is no document editing there, though. PDF Viewer. 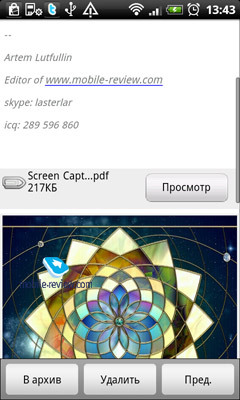 It is a PDF viewer, based on Adobe Reade LE 2.5, from HTC. Voice dial and control. 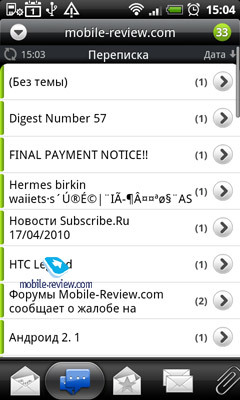 Whether or not Android and HTC devices in particular have such functionality, is a popular question on the forums. Well, HTC doesn't offer that, unfortunately. 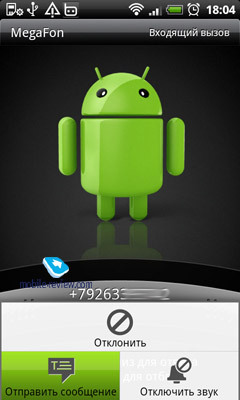 Both voice dial and voice control are available in Android 2.1, though. 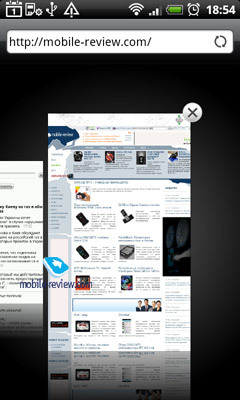 The browser in Sense is similar to the standard Android 2.1 issue, save for a few extra features. It has no problem working with WEB 2.0 or Google services, such as Google Maps, Picasa, Gmail, or various character encodings. The first peculiar feature of the browser in Sense is its full Flash support. 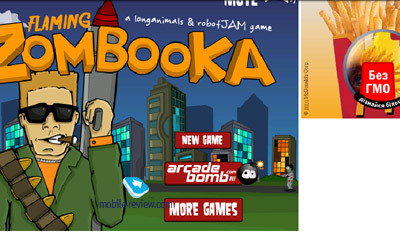 It allows the user to play almost any browser game, watch streaming video on some websites, and so on. Banners and various Flash ads are dynamic and look the same as on the desktop, which can be both a pro and a con. One comment needs to be made, though. First of all, the browser works with significant delays when Flash is on. And secondly, not every single Flash game will be displayed properly, and even though the fullscreen mode is supported, every now and again you won't be able to enjoy that due to: (a) incorrect Flash display; and (b) severe delays during the game. It is good that HTC is not strict about Flash and allows you to turn it off to get rid of all browser delays. If you press the search button while in the browser, that will open the Google search window. There is also full text webpage search available – just press Menu and choose the page search option. The text search is real-time and starts as soon as the first few characters are entered. If the text appears several times on the page, then the first occurrence gets framed while the rest get highlighted in green. When searching, the only way to navigate around is using the arrow keys. If you try to scroll with your finger, the search results get discarded, which I consider a disadvantage. On the upside, you can look up word combinations and get feedback on how often your search phrase is matched. The browser allows you to store an unlimited number of bookmarks. To create one, it is enough to bring up the menu and choose the Create Bookmark option. When a bookmark is created, only its name and URL are stored. The bookmarks can be displayed in three different ways: the traditional list of saved pages, matrix of thumbnails, or "visual," which is eye-catching but not as convenient as the first two. You can search through the bookmarks and sort them by date created, access frequency, or alphabetically. Any bookmark can be edited, sent as a link by e-mail or text message, or even as a shortcut to one of the system desktops. 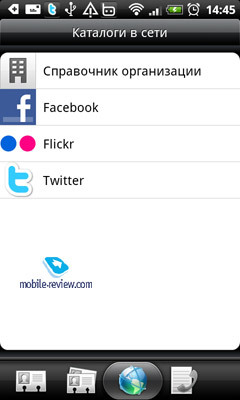 Among the disadvantages of the bookmark system in Android, is its lack of support for folders or tags (that is, some categorization) as well as for some synchronization option (with a server or local computer). There is also a list of the most visited resources and browsing history available from the bookmark menu. The browser supports up to four open tabs (windows) at once, you are simply not allowed to have more. To open a new one, you need to go to the windows menu and press the appropriate button. To switch between the opened windows, you can use a special menu that displays them as thumbnails. Any link can be opened in the same or new window by simply clicking on it. Just tap and hold for a while, and then choose the desired option from the menu. You can also use a trackball or touchpad for that. The browser has an excellent algorithm of text rendering regardless of the current page zoom level. While the page is being downloaded, the text gets scaled to the screen width. If you zoom in, it gets rescaled to fit the screen width again. The process takes just a second and you can zoom in until the font size is okay for you. After that, the browser will automatically arrange the rescaled text into a single column for your comfy reading. Text rescaling works for the whole page – i.e. done for one frame, it is then automatically applied everywhere. For example, on our website, such frames are the news column (on the right), the main text (in the centre), and the section list. While you are reading around one part of the website, the text gets rescaled and re-arranged everywhere else. The current page location is displayed with the help of two thin lines on the right-hand side and at the bottom of the screen. They let you know where you are, which can come handy if you have zoomed in a lot and would like to move somewhere else without changing the level. The maximum zoom level is redundant: you can zoom in so much that only a few words will fit into a line. The pictures are not affected by the zoom level, though. The browser helps you with entering the addresses; the suggestions are based on your earlier input and browsing history. 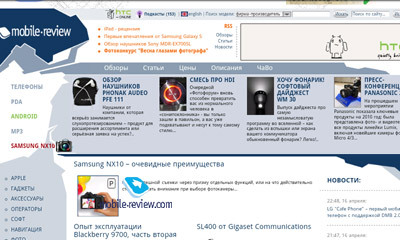 In the previous version of Sense as well as in Android 2.1, the browser also suggests the most popular Web addresses (upon entering "gsma" you will be offered to visit gsmarena.com, among other places, even if you have never been there before); however the feature appears to have been discarded in the new version of Sense. I will appreciate it if you can confirm that or prove me wrong. The browser supports cookies, which allows you to store identification details for various websites and avoid entering passwords on every visit. Such information is automatically recorded upon input; the feature can be disabled and all the passwords and personal data can be wiped out in the preferences if necessary, though. There is also a basic download manager available. If you click on a link to some file, the system will try to determine its type and will let you download it even when unrecognized. At any moment, the download status can be observed in the browser menu of the same name. All files are stored in the /download folder on the memory card. All said about working with text in the E-Mail section is also true for the browser. That is, you can select a word or phrase and in a single click have them translated using a dictionary or looked up in Wikipedia in any language you like. 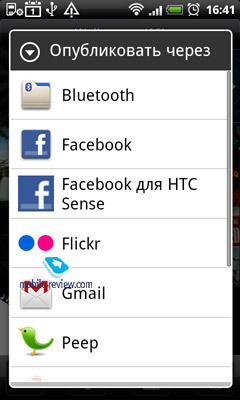 It is another feature of the browser in HTC Sense that is not available in Android 2.1 or any other mobile platform, if I recall it correctly. HTC provides two widgets that allow you to have the browser bookmarks on the desktop. 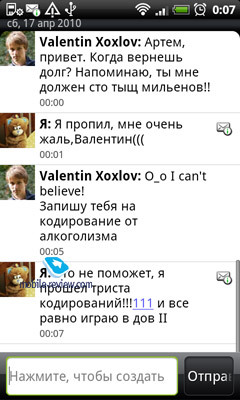 There is hardly any sense to describe those, just take a look at the screenshots. In the browser preferences you can setup your homepage; otherwise, the default one (usually, determined by the device manufacturer) will be opened on every run. The connection type (i.e. 2G/3G/Wi-Fi) cannot be selected manually; the system chooses the most optimal one on its own. If Wi-Fi is not available, the browser will use 2G/3G, and vice versa. In the preferences, you can also block pop-up windows, change the default font size and character encoding, etc. It's quite simple there. The browser if very fast if Flash is disabled, and slow otherwise. In my opinion, HTC is on the very right way with it Sense shell. 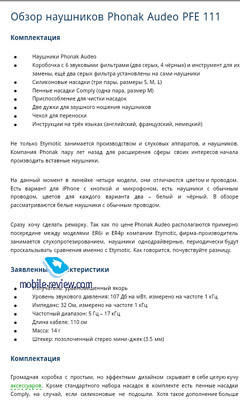 Gradually, step by step, the company is making its smartphone software even better and better. Certainly, this particular version is not perfect and has some bugs, but the innovations, various ideas that it brings along are more important and make a stronger general impression. 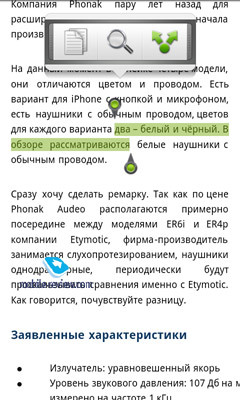 What I would like to point out in the latest version of Sense are its text editing capabilities in the e-mail client and browser, enhanced Exchange functionality (as opposed to what Android can offer by default), custom desktop that is more convenient than the standard one, extra global search features, better support for Facebook and Twitter. All those things put together bring the user experience with Sense-enabled products to a higher level and turn the shell into another argument pro HTC devices. And that must be exactly what the Taiwanese are trying to achieve.